Oracle Part Number T10Z106A-08GB1G Sun Fire T1000 Server, 6 core, 1.0GHz UltraSPARC T1 processor, 8GB DDR2 memory (8 * 1GB DIMMs), 160GB 3.5" 7.2K rpm SATA hard disk drive. Home | Oracle Sun Microsystems | Oracle Sun Servers | Sun CoolThreads Servers | Oracle Sun Fire T1000 CoolThreads Server | Oracle Sun Fire T1000 Server Models | Oracle Part Number T10Z106A-08GB1G Sun Fire T1000 Server, 6 core, 1.0GHz UltraSPARC T1 processor, 8GB DDR2 memory (8 * 1GB DIMMs), 160GB 3.5" 7.2K rpm SATA hard disk drive. T10Z106A-08GB1G Sun Fire T1000 Server, 6 core, 1.0GHz UltraSPARC T1 processor, 8GB DDR2 memory (8 * 1GB DIMMs), 160GB 3.5" 7.2K rpm SATA hard disk drive. Let Econram be the single point of contact for all your IT needs. We will deliver the right equipment at the lowest cost. And not only will we help you obtain quality products to fit your current IT needs, we also help to ensure they fit your Data Center plans for the future. Please contact us to discuss your Sun T10Z106A-08GB1G Hardware requirements with one of our Sun Technicians. We will fully explain the process and advantages of upgrading or replacing your current IT infrastructure. Whatever your needs, Econram can help your company find the right cost effective solution that’s covered by a full 1 year advance replacement Shield+Tech warranty and support. We will test and ship your Sun T10Z106A-08GB1G equipment same day on orders placed before 2PM PST. 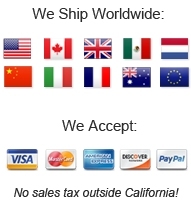 Fast Worldwide Shipping We maintain large inventories of Oracle Sun equipment and parts including the T10Z106A-08GB1G , providing rapid delivery throughout the World.